A day long cooking experience in Cancún with Chef Claudia will allow you to learn about Mexican Culture in a fun, relaxing, professional way including hands on participation. 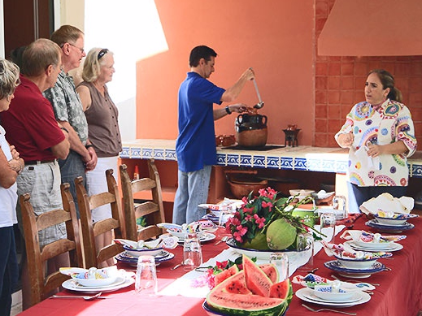 At Claudia´s Mexican cooking classes you will discover the essence and secrets of our traditional homemade specialties, their ingredients and origins, and the way to prepare them. Please note this cooking class is not suitable for . If you still want to book, then proceed. Upon booking this cooking class, we will be checking availability with the tour organizers. The total amount of this booking will be put on hold against your card by the bank, but you will only be charged upon confirmation. Please note that this class requires at least 2 people to activate, in case this class does not reach the minimum capacity 24 hours before the class, we will inform you and offer you a full refund. Come Hungry on this class!